It's been a rough and long couple of weeks since my last review. All thanks to my day job and the eleventh hour prep for Christmas and the new year. Well, now that I've managed to wriggle some time from the daily grind, and also, since I can't sleep, I thought I'd might as well start on another review. It's entirely my wife's fault that I'd spent on watches again. If she hadn't insisted on going shopping that weekend, I wouldn't have wandered into that watch shop. You see, I've never liked shopping with her because I don't really enjoy being a fashion consultant or a porter. So, while she scrutinized over every stitch and seam on every piece of garment and handbag from Prada to Gucci, I followed my instinct and drifted aimlessly into the nearest watch shop. Breezed passed the Hublots, Breguets, Rollies, Sinn, Glycine, Cartiers. WAIT! I backtracked to the Glycine show case. There staring at me was the Golden Eye. "We can offer a generous discount, sir. And there's an additional 10% rebate if you use certain credit cards," says the devil's advocate. "Wrap it up!" came my response after about 20 seconds. A couple of months later, I received a text message from the salesman. "We've got the stealth in stock again. And we are offering a good discount, " it read. I was at the shop within the hour and snapped up the Stealth as well. Now just a brief introduction. The objects of today's review hails from the Glycine's Combat Sub Automatic Specials stable (what a mouthful!). On the right, we have the aptly named, Stealth and on the right, we have the not so aptly christened Golden Eye. Though almost poles apart, visually, both are technically/ mechanically similar. Both are 42mm in diameter, and have ETA 2824-2 ticking away under the dial. Both cases are PVD coated and highly polished. The Golden Eye originally comes with a pair of leather-backed fabric straps affixed to a highly polished PVD buckle. However, it wasn't a happy purchase. Three days after purchasing this beauty, disaster struck. While pulling out the crown to set the time, it came apart from the watch completely, with the stem in tow. I started trying to recall if I had anything unusual for dinner the night before (no spinach, I checked) or was I exposed to some form of radiation recently to acquire such Herculean strength. So after three days of ownership, it was immediately warded for treatment at the local AD. It was a good 2 months or so before it was finally discharged. But I had to bring it back again to have the crown replaced as they only had stock of the stem but not the crown. So after about a month, it was sent back to have the crown replaced. Anyway, I hope that's the last of the problems. The Stealth came with an army/ olive green NATO strap with PVD buckle but polished rings. Kind of a mismatch, IMHO. The buckles on both straps are different as well. The one on the NATO is larger and longer and has a matte finish while the buckle on the Golden Eye has a polished surface but is smaller. Actually, the polished surface on the Golden Eye's buckle look more like it was painted rather than PVD coated. 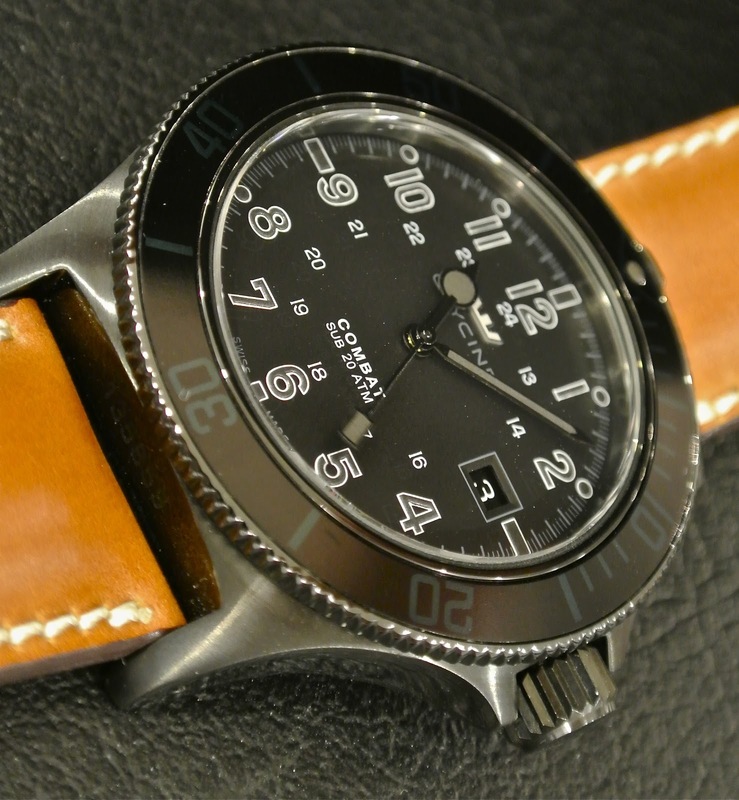 The Glycine signature is embossed on the smaller buckle while the NATO's appears to be etched. The brown and gold combo looks really cool on this watch. The bezel completes a full revolution in 60 clicks. However, it's rather tight but has hardly any free play. The case is matte on the top and polished on the sides. This is not a dual time zone watch so it baffles me why the hour markers start at 1300hr. The case is relatively thin. The gold plated crown is embossed with the Glycine logo. The golden rimmed bezel is another tasteful touch. The Stealth has a black bezel with subdued Arabic markers. The Dial has round indices as well as Arabic numerals. The dial does look a tad busy, no thanks to the additional smaller 24-hr hour markers. The slim case matches the full black bezel better than the Golden Eye's combo, IMHO. The crown is once again signed with the Glycine logo. The screw-down case back is the same for both watches. The Glycine Combat logo takes centre stage with the usual literature bordering the circumference. The serial number is etched on the 6 o'clock position of the case, between the bottom lug, partially hidden by the strap. The lume is also not class-leading, IMHO. The Stealth, in particular, lives up to it's name, especially, in the dark. The blue and green lume combo on the Golden Eye, however, contradicts the serious looking brown and gold combo the watch. These babies sit really comfortably on my wrist. They might be thin but their weight is rather substantially proportionate to their sizes. The comfort is also partially thanks to the extremely soft lamb skin straps I've fixed to these watches. Personally, these watches are far from perfect. But they are aesthetically pleasing. Both are good interpretation of military themed watches - the Golden Eye resembles a general or some senior ranking like a colonel and above, while the Stealth is more akin to a field officer like a captain or below. I like how they look. Apart from the initial problems I had with the Golden Eye, I'm actually rather fond of them. At this price range, they are indeed great value for money. More pictures for your viewing pleasure. - Nice clean dial (Golden Eye). - Catchy dual colour lume (Golden Eye). - No free play bezel. - Early quality issues with crown (Golden Eye, possibly one-off). - Mis-matched polished rings and black buckle on strap (Stealth). - Low quality looking finish on polished buckle (Golden Eye). - Lousy lume (Stealth) - but it's supposed to be a stealth watch!